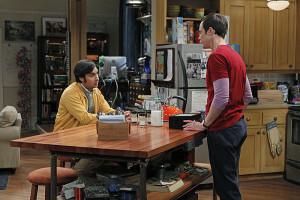 Tonight on the Big Bang Theory: "The Gorilla Dissolution"
A new episode of The Big Bang Theory airs tonight on CBS. “The Gorilla Dissolution” – A bad day causes Penny to reevaluate her life choices – including Leonard. Meanwhile, Howard and Bernadette struggle to care for Mrs. Wolowitz, and Raj gets relationship advice from Sheldon, on THE BIG BANG THEORY, Thursday, May 8 (8:00-8:31 PM, ET/PT) on the CBS Television Network. "The Gorilla Dissolution" -- A bad day causes Penny to reevaluate her life choices ÃÂ¢ÃÂÃÂ including Leonard, on THE BIG BANG THEORY, Thursday, May 8 (8:00-8:31 PM, ET/PT) on the CBS Television Network. Pictured left to right: Steve Valentine (seated), Johnny Galecki, Kaley Cuoco-Sweeting and Wil Wheaton Photo: Darren Michaels/Warner Bros. Entertainment Inc. ÃÂÃÂ© 2014 WBEI. All rights reserved.